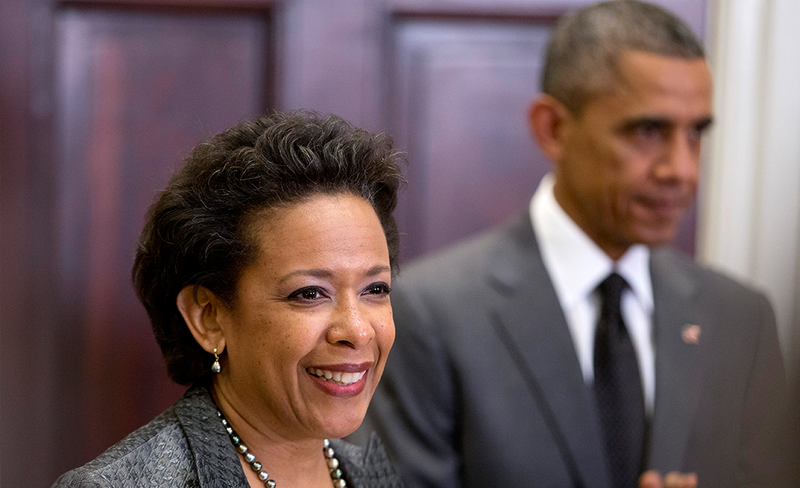 Loretta Lynch, 55, would be the first African-American woman to serve as attorney general. She would replace outgoing Attorney General Eric Holder, who also was at Saturday’s announcement and was the first black head of the Justice Department. Obama argued at a White House ceremony that it’s “pretty hard to be more qualified” for the job of attorney general than the Brooklyn federal prosecutor. “Loretta might be the only lawyer in America who battles mobsters and drug lords and terrorists, and still has the reputation for being a charming people person,” Obama said to laughter from those who packed the Roosevelt Room for the announcement. Republicans have promised tough scrutiny of Obama’s pick after years of battles with Holder, who is close to Lynch and appointed her as chair of a committee that advises him on policy. Holder has been an unflinching champion of civil rights in enforcing the nation’s laws and his successor will be left to grapple with several prominent civil rights issues that have been elevated on his watch. White House officials said they are leaving it up to Senate leaders to work out the timeline for her confirmation, with Obama calling for approval “without delay.” But with Democrats facing a long list of priorities before year’s end brings a shift to Republican control, it’s likely she won’t get a vote until next year. Vermont Sen. Patrick Leahy, a Democrat and the outgoing chairman of the Senate Judiciary Committee, said he will consult about scheduling confirmation hearings with Iowa Sen. Chuck Grassley, the Republican who will take over in January. “She will appear before the Senate Judiciary Committee in a public hearing after we have had time to review her record,” he said in a statement. Lynch was chosen in large part because the White House sees her as likely to win approval among the political divisions in the wake of Republican victories in Tuesday’s midterm election. Lynch is the U.S. attorney for the Eastern District of New York, which covers Brooklyn, Queens, Staten Island and Long Island, a position she also held under President Bill Clinton.